ABC’s & 123’s – Play and Everyday Experiences is the Best Way to Teach Academic Concepts to Your Little Hero! Professionals use terms like Cognitive Skills, Cognition, and Academics. If you substitute “thinking skills” for “cognitive skills” it makes things a bit more clear. “To think” means receiving, processing, analyzing, understanding and remembering information as well as solving simple and complex problems. Matching shapes, labeling colors, turning a knob to activate a toy, or learning how to work an iPad are all examples of cognitive skills. As a Developmental Specialist, I find cognitive skills (thinking skills) to be one of the most important areas in a child’s development. Without growth in cognitive development, a child’s communication, social abilities, and even motor skills will only go so far. Yet, this area is often overlooked when writing and discussing IFSP and IEP goals, preschool readiness, and other developmental milestones. * When most people think of cognitive skills, they think only of academics. Particularly in the Bay Area and Silicon Valley, let’s face it, kids (and their parents) are under a lot of pressure to know the following concepts early on so they get into the “right” schools: colors, numbers, shapes, sizes, letters, knowing your name, age and where you live, among many, many other things. We always want to continue challenging children to learn and grow beyond what they have already mastered. I like to keep the expectation bar high, yet achievable, with the children I work with, while providing them with the support that they need. I want them to grow to their highest potential possible, so I start with what they already know and build from there. We absolutely want to close the gap of where they are and where they should be if there is one. The important thing to remember is not to push a child so hard that they get frustrated and give up or to teach them at such a high level that the concepts go over their head. You have to find the right balance; and that’s one of my specialties! As adults, we never stop learning new things. Children are no different. The trick is, to learn what motivates them and use that to teach the new skills we want them to master. For example, say we want to teach a child how to identify and name colors. In my opinion, the best way to do this, as with teaching other skills, is to teach through everyday routines, experiences, and play. Rarely in my experience, has a young child been willing to sit with a parent and go through colored flashcard after flashcard while the parent labels the color for them – BORING! Would you want to learn in this manner? No way! But, make it fun and engaging and center it around what the child is interested in doing and now you’ve got their full attention!! Or put that learning opportunity into an everyday routine (like mealtime) and now the parent is happy too. It’s a win/win situation. So, let’s say little Suzy is really into music at the moment. 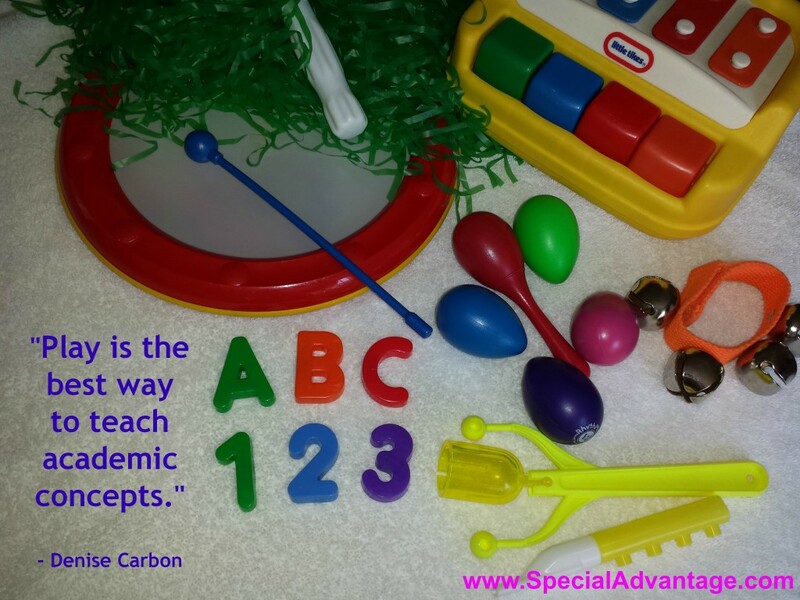 Off the top of my head we can use songs and movement, musical instruments, colored pom-poms and streamers, dress up clothes in various colors, specific games, and motivating foods to teach these color concepts in fun, musical, engaging ways. Over the course of a week you can choose to focus on 1 or 2 colors; I usually recommend starting with only 2 basic primary colors – let’s say red and green. Don’t move on too fast, it will be too confusing for your little one. Let them learn 1 or 2 first and then move on to new colors later. (Substitute your child’s name and the color they are wearing/learning). 2) Have a parade! March around the house, yard or park while wearing your colored clothing or dress up costumes that also meet your color for the day (Red: firefighter, racecar driver, Mickey/Minnie Mouse, Green: medical doctor scrubs, Green Lantern, Tinker Bell, etc.). While marching you can shake colored pom-poms, streamers or play musical instruments; also re-enforcing the color of the day. Sing songs or naturally talk about the colored items you find along the way as you march around the house. Don’t forget to make it fun and focused around music and movement to keep her attention! 3) Remember to offer choices and opportunities to play matching games. “Do you want the red pom-pom (while shaking the red one) or do you want the green pom-pom (while shaking the green one)?” This brings her focused attention on the correct color as you are labeling it for her. “Red drum (bang bang) or green shaker (shake shake)?” OR – “You have a red shirt on today. Which one of these pom-poms is also red?” If she selects the wrong color – that’s ok, it’s not a test and she’s still learning so just tell her “oh you picked the green one! I’ll use the red one” and start marching around! When she is ready to trade, you have another opportunity to label them for her. Talk about colors naturally throughout your day or during the game you are playing, but remember, it’s about fun while building in the learning concepts. If it’s not fun, you’ll lose her. I like red don’t you? I like green don’t you? Pretty please, give me a slice. Hurry up and take a bite. Make a really special snack. Yum, yum, how rich and mellow! A dessert that can’t be beat. A good fruit to eat, I think. Do have some, you really should. Try some now, go right ahead. Here, put a few in your lunch. 5) Have a scavenger hunt for “red” things. You can find the first red item so she has something to match it to and compare if it is the ‘same’ or ‘different’ color. Let’s see if we can find something red in your bedroom! Oh look! I found your ladybug pillow and your ladybug is RED! Can you find something red? Help her find something and be successful since she’s just learning this! J You are right! Your fire truck is red too! Start a pile of red items on the floor so she can see that all the red things match and are the ‘same’ and when something doesn’t, label it as ‘different,’ ‘not the same’ or label the color for her. These kinds of games might be hard for her at first, but soon she will begin to understand what to do and be correct more often as she learns the color. Use multiple rooms in your house if you are able to so she learns that colors are everywhere. You can also play “I spy something RED” when you are out and about. Even if you don’t know if your child is ready to learn about colors yet it couldn’t hurt to talk about them and expose your child to these concepts during the day. You always want to keep that expectation bar high because you never know what is sinking in. *Individualized Family Service Plan (IFSP) and Individual Education Program (IEP). This entry was posted	on Wednesday, August 20th, 2014 at 7:10 pm	and is filed under Cognition. You can follow any responses to this entry through the RSS 2.0 feed. You can leave a response, or trackback from your own site.